Rome is incredible. It is full of romance. The people are expressive, argumentative, and full of life. They talk to one another as if they have known each other for years. In the midwest, we smile and are friendly to everyone, but in Italy, you could see people walk up close to someone and ask for advice in an absurdly casual manner. Even when an Italian is angry, they will yell at you as if you are arguing politics with a cousin at Thanksgiving dinner. Rome has existed for more than 2 and a half thousand years. There are ancient ruins everywhere. So much of what we have today came from Rome. It is an incredible city. I came to Rome on a school trip with my Art Appreciation class. We've been learning about the history of Rome and also how to analyze art and understand the differences in time eras whilst appreciating art. Our professor is the quickest processor of information that I know. She speaks in poetry and uses solely romance words. While walking, she would quietly slip her arm into yours and come close to you and ask you about how you are or what you think about the art or explain why something is magnificent. She was a mother and a guide. I could spend all day just listening to her talk about anything that comes to her mind. She cares about the world and knows the importance of experiencing a life that is beautiful. I could never have asked for a better professor or human to experience Rome under the guidance of. Our tour guide, Bruno was also an amazing person. He also has a love language of touch. He would constantly be saying, "isn't that amazing?" while looking into your eyes and placing a gentle hand on your back, genuinely wanting to know if you found it amazing. He gave us every part of Rome that he could. We tasted plants on the streets and felt everything. We experienced Rome not with one sense, but all of them. He was family and I wish I could steal him and pack him on all my trips. The Vatican was beautiful. We went through the Vatican Museums. 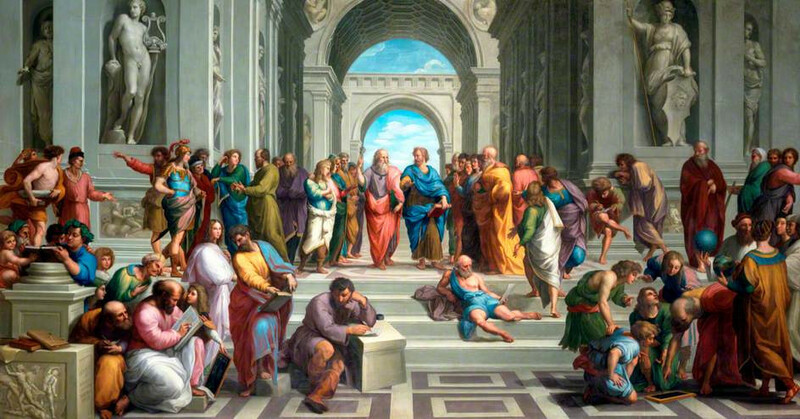 It was incredible to see so many famous paintings in person, especially School of Athens. It's so crazy, when you've seen a painting your whole life, then to see it in person. I've never seen so much art that I loved all in one day. Raphael, Michelangelo, they were insane. They were geniuses, but also slaves to their labor. I especially loved all of the harmonious renaissance art, but the elaborate, moving, inspiring, Godly baroque art was astonishing as well. Renaissance art in Rome creates a sense of peace. I could sit with it for hours experiencing its perfection. Perfect colors, perfect lines, perfect shapes. The perfection of light and shadows and angelic faces so full of this mesmerizing restrained emotion. We were lucky. We were in Rome on the off-season meaning we got to see everything with no lines, and with hardly any crowd. It was perfect. We did so many things, it is impossible to write about it all, but the history we learned was incredible and Rome cannot be explained on a page. One thing said by our tour guide that I especially loved was... Roma.. spelled backwards is.. Amor. The stairwell that inspired the Guggenheim. St. Peter's Basilica was incomprehensibly immense. I was able to go to the room that was designated for prayer and meditated on all the beauty. It seems as if trying to absorb all this art in a couple hours could have been overwhelming, which it was definitely was, but it was also so amazing because there was no time to analyze or memorize. Instead it was a fluid motion of allowing the art to pass through your emotions and your vulnerabilities. Every person witnessing the art, praying inside the basilica, wandering through the long corridors are simply refraction of the beauty on the walls. The walls spoke. The floors echoed melodically. People moved differently. Took lighter steps. Spoke softer, more gentle words. We are all transformed by the beauty, without our consent. It is inevitable that we are moved by beauty. Megan, Paige & I went to an Opera Friday night. We saw La Traviata. It was odd to watch an Opera without subtitles because all you had was the music and the visual, but it gave new perspective and appreciation. It was beautifully amplified by the natural acoustics of the church. The Colloseum was amazing. I can't believe the history. It also re-eforced my "no tv" policy. The Roman government gave these people these horrific games to entertain the people, to keep them occupied. Do we want to live a life of staying occupied, or a life of freedom of thought and progression of human capabilities. It reminds me not to be distracted by what is meant to keep people down. On the other side, the Colloseum is truly a magnificent piece of architecture. I felt giddy just being in its presence. It is so big, and so old, and so amazing. On the inside, you could see the stage & how animals and gladiators would be kept under the stage before being propped up into the arena. Also, fun fact, the word Arena actually comes from Latin which is the sand in which was used to soak up blood in the Colloseum. HEATHER BANKS was in Rome at the same time this weekend! We have been trying to figure out how to see each other while in Europe, and of course, after we thought we definitely wouldn't, we ended up in the same city on accident. We sat at a wine bar with Mama & Papa banks, Jake, Heather, and Megan & I. I still can't believe how lucky I got with my beloved freshman year roommate. College would never have been the same without Heather. She was everything I needed at exactly the time I needed it and every time I am with her, I'm reminded of how perfectly harmonious our friendship is. My favorite pillow talk partner. After meeting Heather, Megan & I (already a few classes of wine deep) went to an Irish Pub, called Abbey Theatre. It was crowded and loud, like any good Irish Pub, so we found a two person table in a corner and laughed way too hard over a half pint of cider that lasted us at least 2 hours. I love every conversation I have with Megan. I always feel on the same page with her, mostly just because of the way that she is. She said once a teacher described her as a "gentle leader" which is so true. She is kind and gentle, but is also strong-willed and knows exactly what she stands for. I never stop learning from every conversation I have with her. We spend our pillow talk talking about all the things we love and appreciate about other people and how not being able to lie has actually been a legitimate struggle in both of our lives. She tells me how I should walk upon the earth as if I was walking through a church, with reverence. She has a beautiful balance in her that is contagious. At about 2 am, we began our 20-30 minute walk back to the hotel. The streets of Rome were strangely empty. We scurried quickly down side streets, enjoying our perfect evening. Then we passed the Trevi fountain, and stopped to enjoy its emptiness. There were couples of lovers sitting around the fountain whispering to one another, smiling softly, and enjoying the romanticism that is Rome in its entirety. We crashed the party and walked around the fountain analyzing its artistic characteristics. We crept closer and closer to the fountain wondering if we where exactly the line was of "no trespassing", but we didn't see one, or any police, so we crept up into a corner of the Trevi Fountain and climbed on the limestone around the marble. The next day we saw police patrolling the area & realized we were definitely not suppose to have been there, but now it will forever be "our spot"
Christmas lights in Rome, with heart balloons (of course). So Bruno, our amazing tour guide, has a friend who built a restaurant on a super insanely ancient site. No tourists go there, but Bruno brought us. This wall is older than Christ. Megan and I were so amazed by this wall. I have never touched anything so old in my life. We were talking about how we wanted to take it with us. Megan told me to eat it... so I did. So I ate a piece of a wall from BC. I'm pretty happy about it. Rome was amazing. Full of pasta and loud Italians. With a full experience of art and true friendship.